What happens on a Creative Camp? The program will to some degree be determined by the needs and capabilities of the group. We do our best to cater for people at different levels of creative experience and physical ability, however we are not equipped to provide for people with physical disabilities, unfortunately. The Creative Camp is designed to be an immersive experience, enabling a deep creative connection with the environment. Our remote locations are always rich with inspiration. The art working infrastructure we take along enables you to create comfortably in camp. And the entire camp set up provides enough comfort to be able to simply relax and soak it in when you are not busy creating. Some days may be spent away from the campsite, artworking ‘au plain air’ either within walking distance from camp or by driving to special locations in the vicinity. There will usually be some gentle walking each day and extended walks are a possibility for those who would like it. We do not encourage people to set out on walks on their own unless we know their direction and estimated time of return. For those who want it Deborah offers tuition and support in a variety of media. But for those who prefer to work independently, there are plenty of opportunities to be in solitude, plus the camp offers a stimulating small group environment when you feel like it. Much is gained from sharing our experience of the creative process. The type of things Deb will offer the group will again depend on participants experience and capability. Her ‘workshop sessions’ usually take place in the morning and are often in the style of creative warm up exercises designed to get you looking and loosening up. She does sessions with ink and mixed media. She also delivers sessions on concertina book making and natural dyeing on silk using locally sourced plants when appropriate. Debs repertoire of skills is broad and she is always willing to share her experience and opinion when invited to. Her primary focus is to enable your creative experience, assist you in whatever it is that ‘draws you in’ and to help you quiet the ever present critic. She does not intend for people to learn by imitating her way of working, at all times she fosters your own unique approach. In most cases our campsites are ‘bush’ camps, so there are no amenity blocks and consequently no buses, caravans and crowds of tourists. 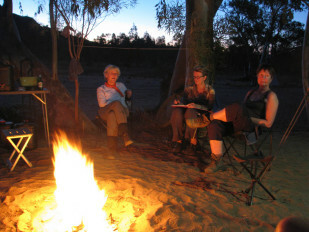 However Larapinta Creative Camps provides you with everything to make sure your camping experience is comfortable, safe and secure, as well as exciting and adventurous. On our Ross River Creative Camp accommodation is in self contained cabins and meals are provided by Ross River Resort so information presented here about bush camping does not apply. All our locations are chosen for their beauty and comfort. They are places that we have camped at previously, so we are familiar with the lay of the land. If proximity to Alice allows, we set up the basic infrastructure before the camp. There are no shops, so we take everything that we will need for the week. We don’t travel back to town during the week unless there is an emergency. We carry a satellite phone for such occasions. Our marquee provides an ‘outdoor studio’ with large tables and storage shelves under cover. We also provide small portable tables, portable stools, comfortable chairs and a number of easels and support boards. We sleep in the trademark of true territorian camping, a cosy ‘swag’ which is an ingenious combination of a comfy foam mattress, pillow, doona and pure cotton sheets all contained by a zippered canvas sheath that allows you to enjoy our spectacular starry skies and a good night’s sleep. For rainy occasions or for those who want more privacy we provide tents. We can provide a limited number of camp stretchers for people who can’t manage being at ground level if we are given advance notice. Stretchers do not make you warmer, the ground’s thermal mass is actually warmer than the air. 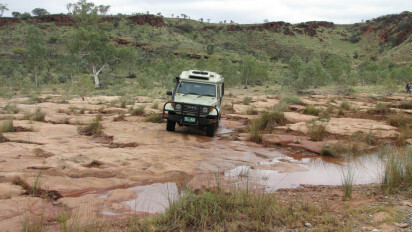 Our transport is a stretched 4WD Toyota Landcruiser with 11 comfortable forward facing seats. We tow a large off road trailer containing a cornucopia of camp infrastructure, food, drinking water, and everything else we will possibly need for the week. 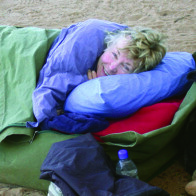 We provide a true camping experience where you will always feel comfortable, & well looked after. At most campsites the toilet is a sit down ‘bush toilet’ that we dig and erect ourselves, it is clean, comfortable and private. To avoid excess damp however we encourage people to use the bush for a pee and provide a portable seat for those who have trouble squatting. At Palm Valley there are flush toilets and a hot shower on location, luxury! But at Running Waters, at 2 Mile on the Finke and Illarari there are no showers. We are always happy to provide enough warm water for a ‘bowl style’ body wash, it’s amazing how good that can feel, and if it’s sunny we can heat a solar shower bag for an outdoor shower experience. At some locations there may be water in the water holes, though often very cold, it is most refreshing. We cook a variety of well balanced meals with plenty of fresh vegetables, such as pasta, curries, laksa, stir frys and grills. Included is a cold beer or soft drink at sundown and wine with dinner. We serve locally roasted coffee and a good selection of teas. Our only complaint is that the food is too good to resist seconds! Breakfast is porridge, muesli or cereal, tea in a pot and/or real coffee. Lunch is packed, wholemeal rolls with cold meat, tomato, cheese etc with fruit, juice, and snacks. Gluten free and vegetarian options are available. Please let us know in advance if you have any medical dietary requirements so we can accommodate your needs. 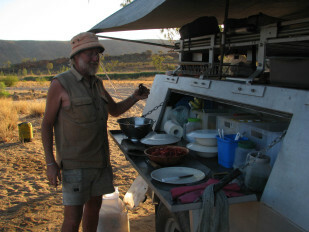 However, we do ask people with non-medical food preferences to relax them for the trip if possible, as our cooking is done on a two burner stove so providing different meals can be problematic. If you are a vegetarian your preference will mean that we will all eat less meat. However, there are a some meals where we can easily prepare a non-meat version. Your cooperation on this will be appreciated. Before a camp like this it’s good to make sure that your body and mind are in good shape. If you have any medical conditions or potential medical issues make sure that you have seen your doctor recently and are well supplied with prescription medications. As we do quite a bit of walking on some of our trips, make sure that any corns, calluses etc. are seen to beforehand and that problem nails are trimmed, and all nails cut. Charlie and Deb are not therapists, and the Creative Camps are not designed as ‘art therapy’ events. Emotions sometimes become heightened around the creative process – this goes with the territory – and of course we do our best to look after participants in their fragile moments. However, if you are ‘generally’ rather than ‘occasionally’ fragile, we are not equipped to respond adequately to your needs. We will supply campers with a comprehensive list of appropriate art materials for each environment and situation, well in advance of the camp. We supply art making ‘infrastructure’ to make sure your creative time is productive and comfortable. We also have a back-up supply of art-making essentials as well as some interesting things for you to experiment with. There are some steep, uneven surfaces on some of the walks we offer and some occasional ‘rock hopping’. If you intend to join in on such occasions then it is essential for your safety that you can focus clearly on the ground. For those that wear bifocal or multifocal glasses this can sometimes be a problem. We suggest you bring some suitable single focus glasses if you require them for walking on rough ground. Likewise it is important that you have appropriate footwear for walking on even surfaces. 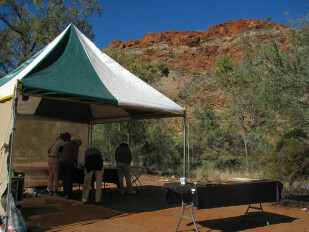 Our Campsites are on even ground but surrounding areas can be quite uneven and rocky. It’s important that you have shoes for walking that are well ‘broken in’ and have a good tread for negotiating slippery or uneven surfaces. Some people require shoes with good ankle support, like hiking boots. Note that these are averages only. Weather in central Australia is characterised by unpredictability and extreme variability. It can be warm in August, and cool in October. It can rain at any time of the year, but usually doesn’t. Our camps adhere to eco tourism guidelines. By keeping our groups small (max 8 participants) we minimise our impact on the environment. We foster environmental awareness by example. We have a permit to operate within the National Parks and adhere to the Parks tourism guidelines and regulations. When on Aboriginal Owned land we obtain the necessary permit from the Central Land Council beforehand. We are proud and grateful to be operating on land with such strong Aboriginal significance. We respect sacred sites and the requests of traditional owners in relation to land usage. 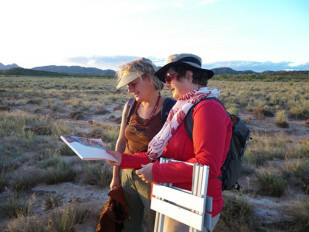 Where possible we consult with Traditional owners prior to the camp. 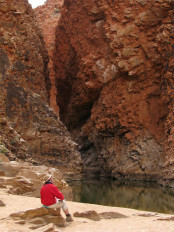 We recommend you check the Discover Central Australia website for local travel and accommodation information.